In this section you will find Documentation & Licensing files related to ESI software solutions. This section is accessible only to ESI customers who are registered myESI users. 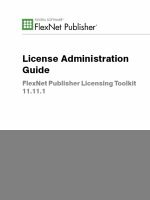 Here you can find the latest available version of the FLEXnet Licensing Toolkit required by ESI Group products. Browse this section and find supported platforms to start a floating license server.